Steeple Chase. It’s the 1920’s and 1930’s in Paris, cafes are humming with excitement, filled with artists, writers, musicians, film makers, the advante guard. Women are experiencing a new freedom; they have the right to vote, dressing is no longer oppressive and they are being accepted into these circles. They can express their sexuality and with photography a new form of erotica is taking shape. Shorter skirts, nylons and garter belts are all the rage. “In olden days a glimpse of stocking was looked on as something shocking, but now Heaven Knows Anything Goes”—this quote by Cole Porter sums up this new era. With this cafe society came gambling as entertainment and horse racing was a popular pastime; the game Steeple Chase grew out of this. 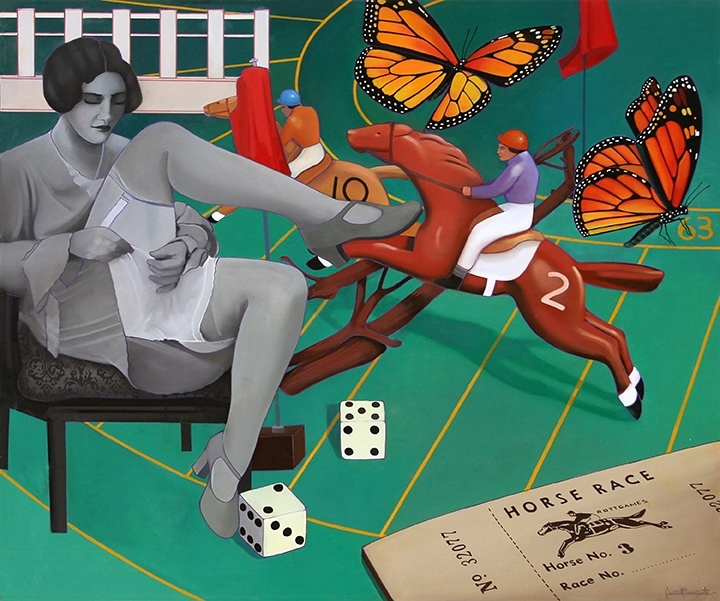 A green felt track was spread out on a table forming the track, jumps or steeples were set up and small hand painted lead horses with jockeys were moved around by the roll of the dice. Betting slips recorded your horse number and your wager. Smoke filled the room from Gauloises and the popular drink was Absinthe. It was a unique time in history and with these paintings I have tried to capture some of that excitement and gaiety. Many cultures associate the butterfly with our souls. Around the world, people view the butterfly as representing endurance, change, hope, and life. The butterfly also symbolizes transformation as it changes from caterpillar to winged adult. 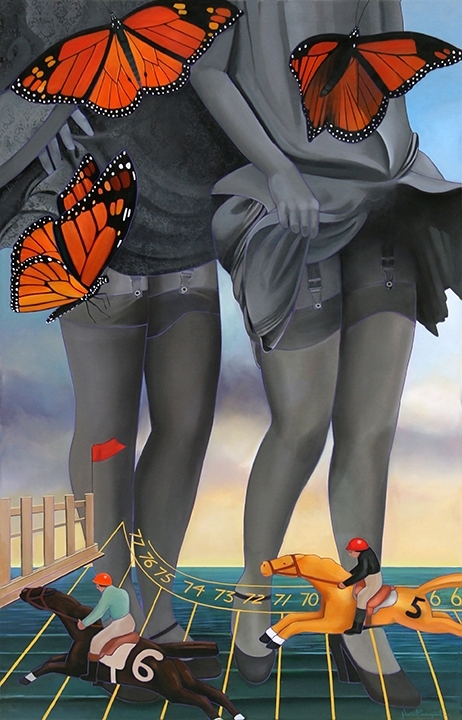 Amicosante’s paintings have been exhibited throughout the United States, including the Cape Cod Museum of Art, the Cahoon Museum in Cotuit, MA, the Provincetown Art Association and Museum, and the Cotuit Center for the Arts. He is a member of the Copley Society of Art in Boston, MA. Amicosante was a participant in the 2009 Biennale Internazionale Dell’ Arte Contemporanea in Florence, Italy. Trained at New York City’s School of Visual Arts, he has established a reputation as a magic realist painter.